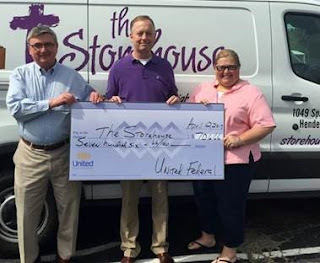 Bill Schreck, UFCU Hendersonville branch manager (center), presents a check to The Storehouse Chairman Robert Pierce and Executive Director Lynn Staggs. United Federal Credit Union (UFCU) was pleased to make a recent $700 donation to the Storehouse in Hendersonville, North Carolina. The Storehouse provides food and hygiene products to people with limited financial resources and, often, limited life skills in Henderson County. Over the years, The Storehouse has added the Blessings in Boxes program, which provides Christmas clothing and toys to children in need, and The Coat Closet program, which provides coats, hats, gloves and blankets. They are currently developing life skills education programs.